ILA_5150 GmbH offers PIV solutions for your individual needs. From educational packages to fully automated robotic solutions in your large-scale wind tunnel: you’ve got the task, we have the means. The new LPS3 is there! We have proven PIV solutions for everyone. You just need reliable data? Rent-an-Engineer! 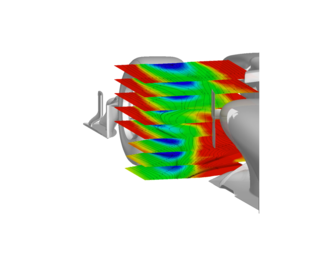 Spanning over an area of 400x400 mm, 2D-3C measurements were taken in the wake of an axial automotive fan to validate CFD Results. Understanding flow behaviour within and around filling equipment in the pharmaceutical industry is crucial. 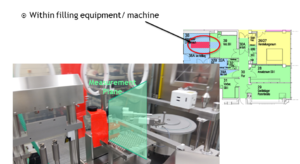 In an on-site case study, effectiveness of PIV Measurements as valid (replacement) procedure was tested. YASKAWA is a world-leading manufacturer of servo drives (Sigma-7 Series), inverter drives (such as the GA700), and Motoman industrial robots. Founded in 1915 in Japan, the company’s philosophy has been based on the principle of highest quality for more than 100 years. PCO is a Pioneer in Cameras and Optoelectronics with more than 30 years of expert knowledge and experience developing and manufacturing high-end camera systems. PCO has forged ahead to becoming a leading specialist and innovator in digital imaging used in scientific and industrial applications. In-house competence of all significant technical disciplines and partnering with leading image sensor manufacturers ensures cutting edge sCMOS and high-speed imaging technology. The company’s customers’ input has a direct path back to its product development and support teams, enabling constant advancements of hardware and software. PCO’s worldwide entities ensure that its cameras are developed and supported in a way that meets the user’s applications. From its inception in 1987 to present day, PCO has been growing continuously and striven to improve its position as a global supplier by being geographically closer to its customers. To that end, PCO operates subsidiaries in the USA, Canada, Singapore and China along with its headquarters in Germany. PCO supports the constant advancement of science and industry by relentlessly pursuing technological perfection. The company’s cameras are used in scientific and industrial research, automotive testing, quality control, metrology and a large variety of other applications worldwide. FASTCAM, the leading name worldwide in high speed imaging: Used in internationally renowned research facilities in more than 30 countries worldwide, Photron FASTCAM high-speed cameras are trusted to provide high quality results in the most challenging applications and environments. Photron continues to utilise the latest technological innovations to further advance product performance in order to meet the most demanding requirements from users around the world. Amplitude Laser Group is a leading manufacturer of ultrafast lasers for scientific, medical and industrial applications. The group consists of three manufacturing location in Bordeaux and Paris, France, and San Jose, U.S.A., and an extensive network of support offices in Europe, Asia and North America. UNFOLD focusses on the investigation of unsteady flow phenomena by combining high spatially and temporally resolved flow field measurements with - what they refer to as - a fluid dynamical differential diagnosis. They develop methodologies to help bridge the gap between their observations and understanding of the development and interaction of characteristic flow structures (e.g. vortices) and technically relevant quantities, such as aerodynamic forces or power output, with applications in biological and bio-inspired flight, wind turbine rotor blade aerodynamics, etc. Research at the Chair of Fluid Mechanics at Bergische Universität Wuppertal comprises problems of multiphase flows, e.g. in biomedical or process engineering. The focus is on the development of numerical methods to describe and optimize multiphase flows or processes and additionally on the measurement of these flows. Furthermore, coupled problems are part of current research like fluid-structure-interaction, conjugate heat transfer and coupling of thermoelectric processes. Fluid Mechanics in general deals with the description of fluids and their movement. The Institute of Fluid Mechanics (ISTM) at KIT offers lectures, seminars and practical training for students of Mechanical Engineering with the goal to provide a fundamental introduction in to the field, including lectures in English held at the International Departement. Additional courses cover the advanced theoretical treatment of fluid phenomena and also the applied use of fluid mechanics in engineering practice. Olympus is one of the world’s leading manufacturers of professional opto-digital products for medicine, science and industry. As a result, Olympus provides a comprehensive range of solutions. From microscopes for training and routine tasks to high-end system solutions in the fields of life science, there is a system for every need. The product line is complemented by innovative laboratory equipment for cellular research applications and the new all-in-one microscopes that offer user engagement at all levels. finitus GmbH is a long term cooperation partner of ILA_5150 GmbH. CEO and Head of Development Dipl.-Ing. Bert Gerlach supports the electronic development for various projects. With great technical expertise and professional equipment the finitus GmbH is our partner for high quality electronic solutions. Flanders’ Bike Valley (“The Global Cycling Center”) was established in 2013 as one of the first bottom-up clusters in Flanders. As an Open Innovation Center for the Cycling Industry the cluster was founded by 4 local SME’s (bottom-up) which are lead plants in their sector, together with one knowledge institute: BioRacer (a cycling clothes manufacturer), Lazer Sport (helmets), Ridley Race Productions, Voxdale (a specialist in aerodynamics who engineered and designed for Indycar) and Flanders’ Drive (a knowledge center for the Automotive Industry). Flanders’ Bike Valley focuses on 6 major topics: Mobility, Sports (involvement of Belgian Cycling Foundation and Belgian Olympic Comittee), Safety and Healthcare, Science & Technology, Industry&Government and Turism. Within these major topics aerodynamic research plays a large role at Flanders' Bike Valley. 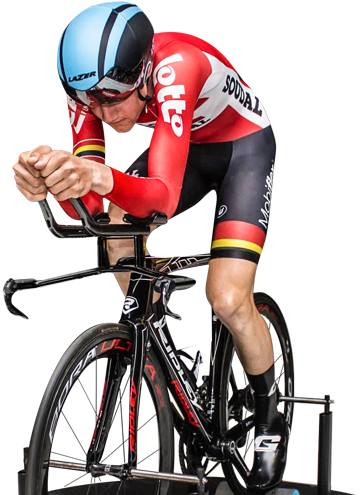 Aerodynamic measurements, mainly focussed on cycling, are performed in the on-site low-speed wind tunnel (wind speeds up to 108km/hr). Although the cluster recently started, the amount of members grew to more than 70 within the last 6 months. This number will still increase in the coming years. More than 50% of the members are other SME’s which come from a diversity of sectors (not only the cycling sector) like electronics, design, ICT, Healthcare,… Flanders’ Bike Valley organizes partner matching events (often together with other clusters/valleys), is setting-up breakthrough open innovation projects for multiple partners and will also focus on joint internationalisation and incubation in cooperation with BikeVille Incubator (the goal is to set-up a cycling technology incubation center). Since cycling is anchored in the roots of the Flemish People (as early adopters for new cycling technologies) and all involved Flemish SME’s are globally leading innovators in the cycling world, Flanders’ Bike Valley is seen as a smart specialisation for the Flemish Region. OPTOLUTION Messtechnik GmbH is a small, technology and customer oriented company for laser optical flow measurement. The company offers various metrological services, equipment and experience in the area of optical flow and volume flow measurements. There are three distinct strategic business areas: •	On-site calibration of flow sensors and volume flow measurements within industrial applications •	Metrological services for laser-optical flow measurement and diagnostics •	Optimization and development of equipment for aforementioned tasks The accredited DAkkS calibration laboratory according DIN EN ISO/IEC 17025 is a core part in the company’s industrial service offerings. This service includes on-site calibration of flow sensors within the industry of district heating and drinking water supply as well as flow diagnostics in flow meter calibration test benches. Since 1992 Boston have been dedicated to helping our partners succeed; we are a world renowned solution manufacturer, designing our own range of servers, storage and workstation solutions. We are experts in solutions and HPC system design, using premium equipment from Supermicro and leading component partners. Striving to provide our clients with first-to-market technology and tailored solutions, our high performance, mission-critical server and storage solutions can be customised for every client. We can help you to create your ideal solution, customising the specification, design and even full custom branding. Coherent Scientific is Australia’s leading supplier of scientific lasers, advanced imaging systems and related equipment. We have served the local flow measurement community for over 25 years and look forward to discussing how ILA5150 products can be used in your next project. Established in 1970, Quantel is a recognized expert in the manufacturing of solid-state laser systems for scientific, military, industrial and medical applications. Quantel Laser offers a wide range of products that meet the special requirements of industrial, military and scientific applications including: •	Pulsed solid-state lasers (Nd:YAG, Nd:YLF and Nd:Glass) •	Fiber lasers for marking and engraving, atom cooling and trapping •	Tunable dye lasers •	High power laser diodes. Quantel also designs and manufactures custom lasers to meet unique application requirements. Furthermore, Quantel offers Laser Damage Test services. With several subsidiaries in Europe, the Americas and Asia and more than 80 partners, Quantel is present all over the World… and beyond with the Curiosity Mars Explorer robot. Researchers, product developers and manufacturers rely on MTS test and simulation solutions to help them create a better world. As leaders in force and motion control, MTS Systems Corporation designs test systems and solutions to assess structural durability, vehicle dynamics, and aerodynamic performance of full vehicles, modules and components. With information gained from MTS test systems, organizations can provide higher-performing, safer and more energy-efficient solutions for the world. Ideas, skill and experience for your success. For the implementation of your projects, Dohm Pharmaceutical Engineering relies on a 20-year experience as certified service provider in the Life Science Industry. Our interdisciplinary team of highly qualified and motivated specialists is working to fulfill your individual requirements: ranging from the master-plan, a feasibility study and engineering to process optimization for pharmaceutical facilities, processes and systems as well as GMP compliance. We’re developing individual solutions for your projects using innovative methods and thus ensuring a GMP-compliant management. Highest quality is being secured through thorough planning. Nanoptic Inc. is a incorporated small venture business who devotes itself to development of PIV and Thermal-Fluidics technology. It has many partners which are ILA, MSE and Fresnel Technologies. And also we are straining to develop telecommunication-related sensors, robotic and optic parts by incorporating micro-precision production technology with MEMS and R2R manufacturing technology. Aseptec Sdn Bhd is a scientific instrument distributor for a range of reputable scientific instruments and equipment manufacturers, supporting the scientific community in research institutes, universities and private laboratories. We offer instrumentation solutions for researchers with possibilities from manual to automation, from fix setup to flexible modular system, qualitative and quantitative measurements with local service support. NS Scientific is a leading scientific instrument distributor/system integrator capable of providing complete pre and after sales support to its customers across India. NS Scientific mainly deals in VSM systems, scientific Lasers and Laser based instruments including LIBS, spectroscopy systems, PIV, PLIF, LIF and Superconducting Magnet systems etc. Their engineers are capable of providing full spectrum of support which starts by helping the customers to select the right instruments for their experiments to installation, integration of our instruments with customers’ existing experimental set-up and after sales technical support.